The ARP 2600 is without a doubt one of the finest analog synthesizers ever. It is very popular and has been used by artists for over 20 years in all forms of music, especially today's electronic music. The 2600 is a professional, semi-modular monophonic patch-cable synthesizer that competed directly against the first professional Modular Moog synths during the early 1970's. Unlike other modular systems of the time which required you to pick and choose modules which you (or the manufacturer) then had to mount inside a case and wire together, the 2600 is semi-modular with a fixed selection of basic synth modules internally pre-wired and ready to go! Most of these connections can be "re-wired" with patch-cords and clearly labeled patch-points. This made the 2600 more user-friendly, portable and easier to create sound with! The 2600 is a 3-VCO analog beast capable of creating some amazing sounds thanks to exclusive ARP technologies. True to analog synthesizers the 2600 has plenty of switches & sliders as well to satisfy all your tweakable needs. You have the freedom to route the sounds that originate from its oscillators anywhere you want. If you have a keen understanding of signal-flow and understand how the different synth modules operate, you can create some very wild and some of the most musically expressive analog sounds ever! It even has a built-in spring reverb, amp and stereo speakers. A few versions of the 2600 were produced during its lifetime throughout the 1970's. They are all a little bit different, some changes due to instability issues, some due to legal issues, and some for cosmetic reasons. Version 1, the "Blue Meanie" (pictured top) was the original 2600 produced in 1970. It came in a blue aluminum case. Being their first model, it was prone to breakdowns and was highly unreliable. Only a few of these were made and they were all built in a garage too. Version 2, the factory produced "Grey Meanie" (pictured above) appeared in 1971 and was the first version denoted by the rectangular 'ARP' logo on its right speaker grille. The original Model 4012 filter used in the Grey and Blue meanies was a copy of Moog's patented ladder-filter design. This led to a law-suit between Moog and ARP which forced ARP to design their own filter. Version 3 was the resultant revision after the Moog debacle. This is the most common 2600 model around. These models are denoted by the "G-clef" ARP logo, as a rule. This version employs the Model 4072 filter design, a four-pole lowpass widely considered to be faulty, but which is correctable. The frequency response of this filter only goes to about 12kHz, giving this model a duller sound than models with the Moog filter, but they can be easily corrected up to a frequency response of 20kHz. Version 4 appeared around 1978 and added the modern orange-on-black design (pictured below). 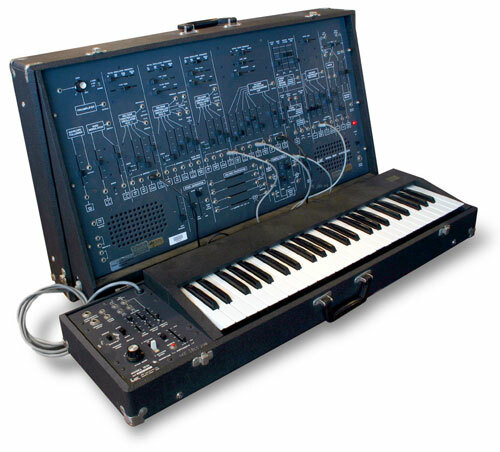 Around 1978 ARP unleashed a whole new line-up of their synthesizers using this new look. For the 2600, this was to be its final version. Very late versions of this model also feature un-potted submodules, making them easier to maintain, but not all orange 2600s were built this way. It can also have the wrong filter model from the Moog suit too. There were also three versions of the remote keyboard: The Model 3601, which is a very rudimentary version, with just Portamento and Tuning controls. The Model 3604 is similar but adds adjustable scaling. Finally the duo-phonic Model 3620 (pictured at top and bottom), which adds a dedicated LFO, latching and some other very useful features. There were 'V.3' and 'V.4' versions produced of the 3620 keyboard as well.